Four years ago, I looked around nervously with a pit in my stomach, and all I wanted to do was turn around and go back home. As I took my first step into High School East as an incoming freshman, my heart beat rapidly, and I didn’t know what to expect. Now, here I am today, four years later, and a completely different person than the nervous little freshman girl I was. This transition is a direct result of my years spent at HSE. My first year at Chestnut Hill Elementary School feels like a lifetime ago, but I can still remember all of the wonderful memories I made my very first year. I didn’t know what the purpose of school was at the time, but I would soon come to learn that it would be a safe haven where I could pave a path for myself and gain one of a kind social and academic experiences. I remember my eagerness taking over as I tried my best to memorize every vocabulary word in kindergarten, and my drive to beat all of the minute math levels in second grade. I didn’t know it at the time, but the motivation inside of me was just starting to grow. My passion for writing began in third grade. My third grade teacher introduced me to poetry and stories. Although at the time writing just seemed like a jumble of words, it became an outlet for me that transformed my ideas into the first real thing that finally made sense to me. I was infatuated at such a young age that the ideas I formulated in my head could come to life on a piece of paper. As I entered West Hollow Middle school, a symbol for the next chapter of my life, I was anxious to see what challenges would be thrown at me next. I learned at middle school that some subjects and activities would intrigue me and pique my curiosity, whereas others would be a challenge. I learned that this was true for all the students around me, and that we all held some similar and different passions. I learned that writing and reading were something I really enjoyed as I excelled in English and Social Studies classes. Moreover, I discovered that art was a passion of mine as I was provided with the chance to take Studio in Art in 8th Grade. I also realized that Earth Science, the first advanced class that I took along with Algebra 1, was difficult for me to understand. I truly had to learn how to push myself and use my motivation in order to get through a class that did not come naturally to me. I didn’t realize it at the time, but my learning experiences were expanding even more, and I was on the road to becoming who I am today. My three years spent at middle school equipped me for the four most strenuous, but exciting years of my life: high school. Almost any senior can admit that the end of their high school journey is bittersweet and filled with nostalgia. During a long and stressful day, a 40 minute period could feel like a century. However, the past 13 years have flashed right before my eyes; all of a sudden my time at HSE is over. It was not until this year that I fathomed how substantial the past 13 years of school have been on my life. High school truly built my caliber and taught me who I am as a person. Throughout high school, I have learned three main lessons that I plan to carry with me throughout life. First, I have learned the concept of motivation and hard work. I always have to push myself to be a good student with excelling grades, as well as push myself to be the best possible version of myself. Without hard work and dedication, all of my accomplishments would be valueless and futile. I spent four years of high school committed to the Thunderbird, and with hard work, I went from a basic writer to an equipped Print Manager. As I continued to write and edit more articles, I was extremely proud of myself as I watched my writing skills enhance. Another important lesson I took away from high school is the importance of finding your passions. Throughout my four years, I discovered that writing was a path I wanted to keep exploring. I took multiple english related electives and joined several clubs in the field. I also participated in a Seventeen Magazine Fashion program this summer at UCLA, combining my passion for writing and fashion together. All of these experiences catalyze my decision to major in communications/journalism in college. I also learned that, outside of future career paths, I have a passion for helping others. Since 9th grade, I have been an active member of the Friendship Circle, which is a program that brings together kids with special needs and teenage volunteers. My dedication to the Friendship Circle led me to my summer job at Sunrise Day Camp, a non-profit camp for kids with cancer and their siblings. Working at Sunrise allowed me to feel happier than I ever have felt in my life. My past four years have taught me to always follow my passions and do what makes me the happiest. The third lesson I have taken away from high school is the importance of relationships with others. I couldn’t have gone through high school without my family, friends, and teachers by my side. I am beyond grateful for the teachers that provided me with not just the information I needed to do well in their classes, but also with guidance that I can use throughout college and beyond. I am also extremely grateful for my one of a kind friends and family who have been my shoulders to lean on throughout every moment of high school. Whether I was sitting in a classroom learning new algebra equations, or cheering in the bleachers during our school’s annual Comp Night, I have grown to appreciate the multitude of experiences with which I have been provided and will always be invaluable to me throughout my future endeavors. I am glad to have had four breathtaking years filled with learning lessons in and out of the classroom, growing a vast base of knowledge, exploring my passions, forming one-of-a kind relationships with both my friends and teachers, and becoming involved in the HSE community. This upcoming year, I will be attending University of Florida and am a part of the College of Journalism and Communications. I’m glad to be embarking on a new journey in my life, and I feel proud to be ending my final chapter of high school on such a positive note. I am lucky to have had the pleasure of getting to grow with my fellow classmates, and I see the same drive and passion instilled in their bodies that I feel in mine. 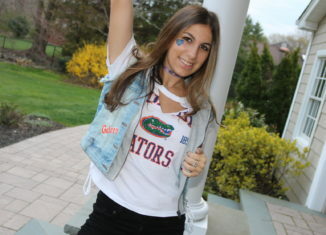 The experiences I have had at High School East were beyond imperative, and I will continue to keep my four momentous years spent at High School East close to heart as a Florida Gator.